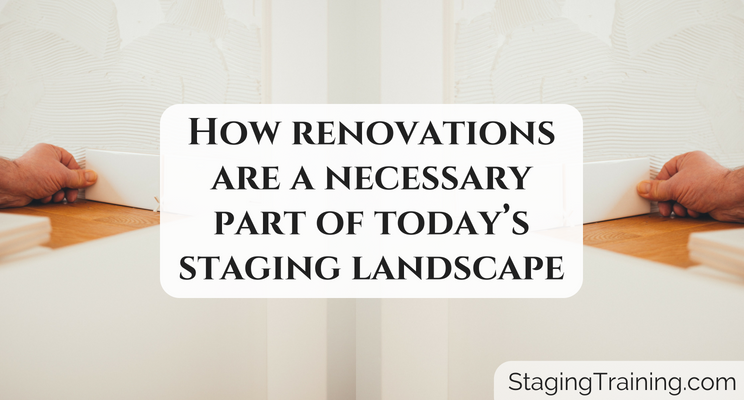 How renovations are a necessary part of today’s staging landscape. 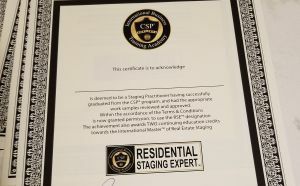 The staging industry is evolving, and perhaps the word “staging” is becoming a limiting descriptor of the services we provide. When we speak with our customers, we tell them that it’s our job to help them prepare their property to maximize its value in the eyes of the buyer. More and more often during staging consultations, we see the need for the seller to do more than just declutter, depersonalize and then let us stage the property. At the very minimum, sellers need to have their property painted, update light fixtures, and have their carpets and windows cleaned. But to truly maximize the value of their property in the eyes of the buyer, sellers should actually focus on investing additional dollars into more in-depth renovations. First and foremost, a lot of sellers have had their homes for many years and haven’t performed many upgrades over the years. Maybe they finished their basement when they moved in, and maybe they upgraded their kitchen (a bit) at some point. But that may have been years ago, and upgrades, particularly kitchens and bathrooms, can get dated pretty easily. The fact is, most owners adapt to their homes and aren’t “bothered” if their house is not up to the latest design trends. But on the other hand, buyers increasingly want more than simply “move-in ready” properties. They want updated or upgraded properties that fit a modern lifestyle. Perhaps they’ve been spoiled by watching all those home and reno shows on television; or perhaps they want to keep up appearances with friends and family; or maybe THEY simply don’t want to have to think about living through those renovations and upgrades themselves. Regardless of the reason, buyer preferences need to be understood and met. 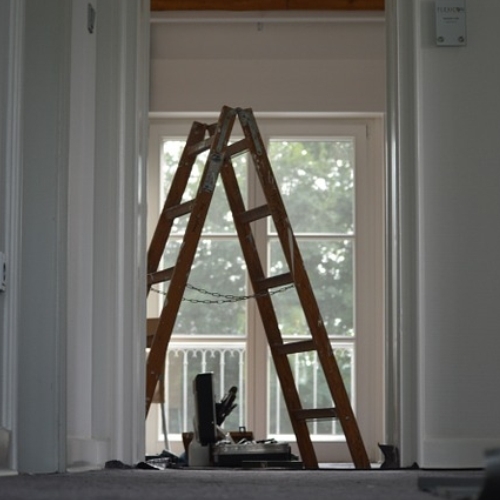 But there is another, and in my opinion even more important reason that sellers need to invest – yes invest – in renovating their property before selling. We all know that every property will sell for a price. Even the most rundown, aged and miserable looking home will find a buyer. It may not necessarily be the price that the seller wants or would accept, but the property does have a market value. Most sellers do not understand the true potential of their property before putting it on the market. They don’t understand buyer wants and desires and so are ill equipped to make the best decisions in preparing their homes for sale. And, let’s be honest, not all real estate agents have the knowledge or ability to convince the sellers to make the necessary investment. I’m not slagging agents here, but simply stating a fact based on our experience in the industry. 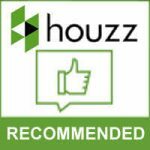 But, we as stagers can and should help educate the seller on how to maximize the value of their property and, if necessary, handhold them in the process. This can be an extra service in our business. And when the seller decides to renovate, they will look to us, the informed stager to guide them on what needs to be done and who to work with. As stagers, we have aligned ourselves with trustworthy, knowledgeable, professional trades who we can refer the jobs to. The agent needs to be in agreement with this strategy. Don’t go down this path without their consent, because they are ultimately responsible for the sale and they may have different timelines and strategy for the sale. As an example, we worked with a client and agent to renovate and stage a property. The property, a fairly standard 3 bedroom, 2 storey home, had a somewhat dated interior. The owner had lived in the home for about 30 years, and had not done any significant updates for at least 20 years. At the start, the owner was willing to do “some staging” in the property, but did not want to put any money into renovations beyond paint and some small repairs. The home would have been listed for about $400,000, and probably would have sold for about ten or twenty thousand above that. After some discussion with the owner, we convinced the owner that the upgrading the dated house could significantly increase the sale price of the home, and of course, the amount of money they would pocket after the sale. The owner committed about $50,000 to upgrade the kitchen, bathrooms and install flooring (tiles and hardwood), as well to paint the entire house, and replace the front door. The renovations took about 3 weeks and then the house was listed for $490,000, and after an open house and multiple offers, it sold for $540,000. The owners were naturally ecstatic with the result; a 140% return on their investment in about 6 weeks. Where else could they (legally) make that kind of money so quickly? But to be honest, they were quite anxious during the renovation process. And why not? They were making an unplanned $50,000 investment without any guarantee of an ROI. We tell our clients that contrary to what they may have heard or understood, “staging is not just the pretty”. It’s not simply about decluttering. It’s not simply about putting in some nice furniture and artwork and accessories. Unfortunately too much focus is on the photos that go up when home is listed. Staging is about truly understanding buyer demographics, needs and preferences and then optimizing the property to meet those needs. The agents we repeatedly work with understand this, and in fact appreciate and value the work we do. Not only do we make their job easier, but our work increases property value, customer satisfaction and the agent’s top line. The seller, the agent, the buyer and, of course the stager all benefit. Can you say win-win-win-win? Sadiya Qureshi, Certified Canadian Staging Professional (CCSP) and graduate of the Interior Design Institute (IDI). 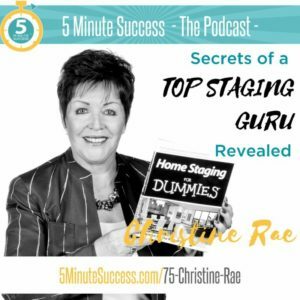 What Can Staging Training Do For You? ★ I want to get a FREE Info Packet about the CSP Designation. 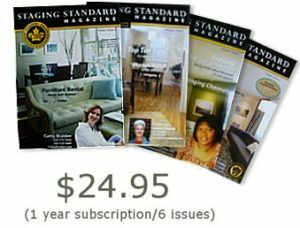 ★ I want to start my staging career OR I want to become a highly profitable stager. 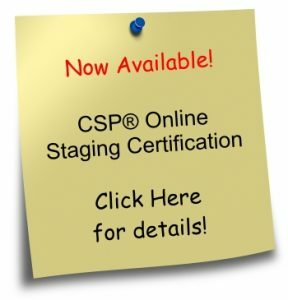 ★ I want to learn more about the time-tested webinars and other certifications from Staging Training. Questions? Call us Monday through Friday 9:00am to 5:30pm EST. Our toll free number is: 1-888-STAGING (782-4464).